This book of hours is illuminated in a style combining features typical of a group of manuscripts made in Suffolk, probably Bury St. Edmunds. Heraldry in one of the initials indicates that the manuscript was made for a member of the Hamelden family, of Holton St. Peter in Suffolk. This parish is on the outskirts of Halesworth, in an industrial estate where Bernard Matthews turkey products are made. This heraldic arms in this initial have been identified as those of the Hamelden family, of Holton St. Peter in Suffolk, but it has not yet been possible to suggest which member of the family owned this manuscript. 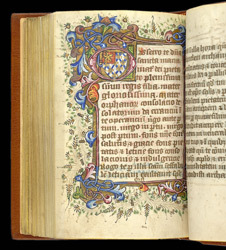 Most of the manuscripts illuminated in the 'Bury St. Edmunds' style were made for Suffolk patrons, including the abbey of Bury St. Edmunds itself.